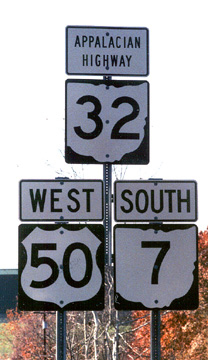 In Ohio, Appalachian Corridor D (OH 32) is marked with special "Appalachian Highway" banner signs. Many of those signs near Belpre have the word "Appalachian" misspelled as "Appalacian." This is an example, photographed in October 1999.